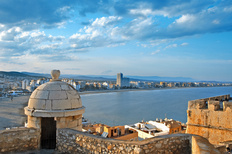 The airport is particularly busy during the summer months when northern European tourists come to the area to spend their vacation on the Costa del Azahar and Costa Blanca. The airport is managed and operated by AENA, who are also responsible for monitoring Spanish airspace. From Valencia on the A-3 to Exit 349-A, then follow the signs to the airport.